The Connecticut State Grange Public Relations Committee offered 7 Contests in 2013. We would like to thank all of the Granges for participating in the contests and increasing their public awareness over this past year. Let’s see these numbers increase for 2014! 1.) Creative Video Contest - Granges were asked to submit a video promoting their Grange. There were no entries received for this contest this year. 2.) 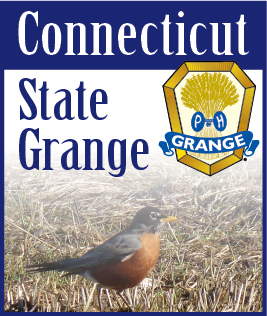 CT State Grange Website Participation Contest - Recognizes Granges who submitted information to be published on the CT State Grange website. Granby, Redding, Southington, Glastonbury, Wallingford, Cawasa, Senexet, Whigville, Eureka, Harmony Taghhannuck, Beacon Valley, Killingly, Bethlehem, Higganum, Greenfield Hill, North Stonington, Prospect, Norfield, Lyme, Enfield, Cannon, Bridgewater, Norwich, Wolcott, Oxford, Simsbury, Groton. Where both Bob and myself handle the publicity for Meriden and Winchester, we felt it was not fair to judge our Granges along with the others. So Special Recognition Certificates will be awarded to Meriden and Winchester. 3.) Grange Marketing Contest - Granges were asked to create a booklet highlighting the ways they promote themselves to the public. There were no entries received for this contest this year. 6.) Best Newspaper Article Contest - Granges were asked to submit clippings of newspaper articles written about their Granges. 7.) Social Media Participation Contest - This contest spotlights Granges efforts on Facebook and Twitter. Facebook Recognition Certificates: Granby, Cheshire, Southington, Meriden, Whigville, Eureka, Winchester, Hillstown, Ekonk Community, Taghhannuck, Killingly, Greenfield Hill, Prospect, Norfield, Lyme, Cannon, Bridgewater, Riverton, Norwich, Wolcott, Simsbury, Groton Community, Ekonk Community Junior, Central Pomona No. 1, Mountain County Pomona No. 4, New London County Pomona No. 6, Excelsior Pomona No. 7. Best Facebook Pages: Cheshire, Meriden, Winchester, Killingly, Wolcott. Twitter Recognition Certificates: Cheshire, Meriden, Winchester, Hillstown, Cannon, Central Pomona No. 1.